The following Press Release, now retracted, is kept on the web for information and historical reference. The presumed detection of a dust disk around iota Horologii, presented in this Press Release, has been found to be due to an instrumental artefact and is therefore not real. This is the conclusion reached by the astronomers working with the ADONIS Adaptive Optics instrument, following a series of extremely careful tests. In September 2000, iota Horologii - a star which was found earlier by radial velocity measurements to be orbited by a planetary companion - was observed by ADONIS, the adaptive optics system at the ESO 3.6-m telescope. These observations showed an elliptically shaped excess emission around this star when comparing with two reference stars. Such an excess, if real, can only be explained by the presence of a dust disk around this star. A series of new observations - again with the ADONIS system - have not confirmed the previous results. The search for dust disks around stars is a very difficult observational task, because the star is much brighter than the faint extended emission of a dust disk, It is therefore necessary to block the light of the star by means of a so-called coronographic mask. But even this is not sufficient - it is also necessary to subtract the remaining "light-wings" from the star (i.e., the pattern that results from the stray light in the telescope and camera). For this purpose, a "reference" star assumed to be without excess emission is always observed before and after each observation of the "target" star. The light pattern observed for the "reference" star (the standard Point-Spread-Function) is then used to remove numerically the pattern of the "target" star, thereby isolating any additional light that may come from a circumstellar disk. For this analysis, it is crucial that the Point-Spread-Function remains unchanged during the observation of the reference and target stars. In fact, for each observation of the target star, at least two different "reference" stars are observed in order to verify this assumption. 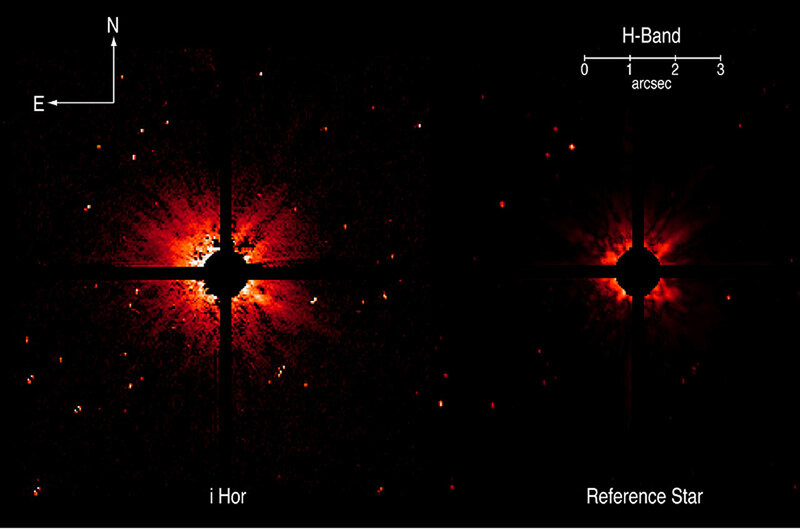 Following this observational methodology carefully, H-band observations of iota Horologii showed an excess emission which was interpreted as the signature of a circumstellar dust disk. Recognising the uncertainties inherent in this kind of observation, the astronomers performed the observations again several months later, this time in other filter bands and with other reference stars, and were unable to confirm the extended emission. In order to investigate this unexpected result, new observations were made to verify the basic assumption that the Point-Spread-Function remains unchanged for reference stars of slightly different brightness (within half a magnitude). They showed that substantial changes in the Point-Spread-Function of the ADONIS system can occur for reference stars in the brightness interval employed for the iota Horologii observations. Indeed, observations of two reference stars with no circumstellar material and application of the standard analysis technique appeared to indicate an excess emission in a pattern ressembling that found around iota Horologii. The conclusion is clear: the presumed dust disk around iota Horologii is an artefact, resulting from an underestimation of the calibration uncertainties in this type of delicate observation. The observers and the ESO EPR Dept. regret the incorrect announcement made in ESO Press Photo eso0033. The star "iota Horologii", 56 light-years from Earth, possesses not only an extrasolar planet, but also a dust disk. This is the exciting result of recent observations with the ADONIS (ADaptive Optics Near Infrared System) instrument, mounted at the ESO 3.6-metre telescope at the La Silla Observatory. Such a disk holds information about the formation of the exoplanetary system. As this is the fourth known example of a star with both a disk and a planet, that combination may indeed be comparatively common among solar-type stars. Our own Solar system also contains dust. When the dust scatters the sunlight, this can be observed as "zodiacal light", a cone of faint light extending above the western horizon soon after sunset or the eastern just before sunrise. The same phenomenon should thus be observable from the planet orbiting iota Horologii. Last year, the star iota Horologii was found to have a planetary companion, at least twice as heavy as Jupiter, the largest planet in the Solar System. It was the first exoplanet to be discovered in an almost earth-like orbit, c.f. ESO Press Release eso9938). This discovery was based on long-term measurements of the radial velocity of iota Horologii by means of the 1.4-m Coudé Auxiliary Telescope (CAT) at La Silla. The extremely accurate observations were made with the Coude-Echelle-Spectrometer (CES) which is now connected to the ESO 3.6-m telescope. With the combination of spectroscopic (CES) and high-angular resolution (ADONIS) observational facilities at one telescope, the 3.6-m is uniquely suited for this type of front-line research. Dust disks around stars still retain information about the formation processes of the exoplanetary systems as they are formed by collisions of planetesimals or proto-planets. However, it is still a somewhat controversial issue exactly how the presence of giant planets influences these collisions or whether the existence of a planetary system can be inferred from observed structures in dust disks. To cast more light on this fundamental issue, it is necessary to search for systems which have both a planet and a dust disk. Our own Solar System contains a significant amount of dust particles which can be seen during very clear evenings and nights by naked eye as a diffuse band of light in the sky - the "zodiacal light". Observations from the Voyager spacecraft have shown that this dust extends quite far out, well beyond the orbit of planet Pluto. The team used the ADONIS instrument with the SHARP II camera to search for dust disks around the iota Horologii planetary system. ADONIS corrects the atmospheric turbulence in real-time by means of a computer-controlled flexible mirror, allowing the sharpest possible images to be recorded with this special camera. In order to detect circumstellar material, it is an absolute condition that the light that is recorded from the star itself is reduced to a minimum. The circumstellar dust reflects only a small fraction of the stellar light and would otherwise be completely outshone by the intense light from the star in the middle. This is achieved by inserting in front of the detector a so-called coronographic mask that blocks the light of the star. The chosen diameter is a compromise between the desire to detect features as close as possible to the star and the rapidly increasing amount of stellar light as the size of the mask is decreased. For the the present observations of iota Horologii, a mask with a diameter of 1.0 arcsec was used (about 17 AU, or 2550 million km at the distance of the star). A series of short exposures were made through a near-infrared filter (in the H-band that is centred at wavelength 1.64 µm), a spectral region where the disk/star light intensity ratio and the instrument efficiency are optimal. In the course of the extensive data analysis the exposures are combined to produce the resulting image of the star. Moreover, to correct for stray light in the instrument, it is necessary to "subtract" the image of a reference star which is known to be free of any circumstellar material. This procedure effectively reduces the unavoidable halo of instrumentally introduced stray light from the star that - despite the mask - is still significantly brighter than the light coming from the disk. The observations were obtained during the night of September 6-7, 2000, during a period of very good weather conditions (seeing about 0.6 arcsec). They consisted of 150 individual exposures, each lasting 4 seconds. After subtraction of the recorded image of a reference star, a wide, somewhat elongated structure around iota Horologii is clearly visible. Although this cannot be seen directly on the photo, various arguments  indicate that this is indeed a dust disk that extends in NE-SW direction . In order to check that this structure is not an artefact of the image processing, exactly the same procedure was applied to images of another star without circumstellar material (right image). In this case, there is no indication of a similar, extended structure. The "noise residuals" in the right image are about 10 times weaker than the light from the disk around iota Horologii, i.e. there is no doubt that the disk is real. Even though these new images are quite sensitive, a direct detection of the planet near iota Horologii is not possible with this technique as its light is several thousand times fainter than that from the disk. Moreover, the planet orbits the star at a distance of only 1 AU and is thus completely hidden behind the coronographic mask which has a radius of 8.5 AU. The dust disk around iota Horologii is quite extended; it is detected to a distance of about 65 AU, i.e. 10,000 million km, from the star. This corresponds to more than twice the distance of Neptune from the Sun. It is also much larger and denser than the dust disk now observed in the Solar System. From the elongation, it appears that the inclination of the disk is about 42°. By means of future observations at different wavelengths, it will become possible to measure some of the physical properties of the dust grains in the disk, e.g., their temperature, sizes and chemical composition. In this context, great progress in this exciting research field is expected when the NAOS adaptive optics facility at the ESO Very Large Telescope (VLT) enters into operation next year. This instrument will have a much higher sensivity and will thus be able to detect fainter disks as well as small structures in known ones that may hint at the presence of orbiting planets. : The team searching for dust disks around southern exoplanet systems consists of: Sebastian Els (Institut für Theoretische Astrophysik, Universität Heidelberg, Germany and ESO-Chile), Eric Pantin (Service d'Astrophysique, CEA, Saclay, France), Franck Marchis (Institut d'Astrophysique Spatiale, Université Paris Sud, France, and ESO-Chile), Michael Endl (Institut für Astronomie, Universität Wien, Austria, and ESO-Chile), and Martin Kürster and Michael Sterzik (both ESO-Chile). : In addition to iota Horologii , the following stars - all in the northern celestial hemisphere - are also known to possess both a disk and a planet: rho Corona Borealis, HD 210277 and epsilon Eridani . 55 Cancri is another possible candidate under investigation. : Several arguments speak in favour of a disk structure, rather than a (near-)spherical dust halo. A disk is a more stable configuration than a halo. It is also rather unlikely that there would be a dust halo around an otherwise seemingly normal G0 zero-age-main-sequence star like iota Horologii . Moreover, mid-infrared observations with the Infrared Space Observatory (ISO) show an excess of infrared radiation. In the case of a star like iota Horologii , this is indicative of a circumstellar dust disk (the dust emits thermal radiation in the infrared part of the spectrum - hence the radiation from a star with a dust disk is usually relatively stronger in the infrared, as compared to stars without circumstellar dust). Furthermore, radio observations with the SEST at La Silla did not find any molecular carbon monoxide (CO) emission; thus the star did not retain a part of its parent cloud. It is also not located in the proximity of a star-forming region and it is extremely unlikely that there would be material along the line-of-sight that may mimic a halo. The circumstellar dust around iota Horologii is therefore most likely to be arranged in a disk.